With a couple of long lasting friends we decided to have an extended weekend break in Piemonte. We departed after work on a Thursday, had booked tastings and restaurants in advance and arrived back in Copenhagen late Sunday night. 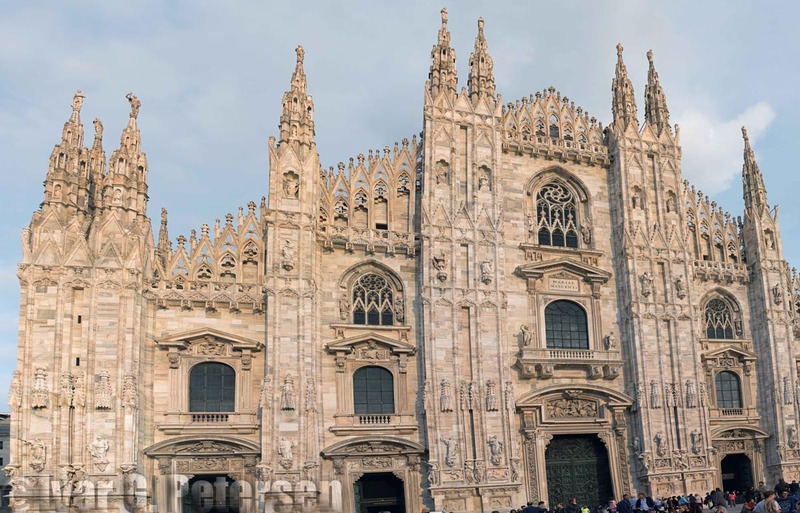 Disregarding the fact the gate is as far away from Security as possible, Easyjet is a fine cheap alternative to the more established airlines, particularly for a short journey to Milano. Service onboard is fine and Malpensa had our luggage on the belt very quickly. Motorways in Italy are great with good signage, but after that, it becomes a little more complicated. In general, even with GPS, we seem to have great difficulty finding the right places – if there are signs, they are often placed very discretely. This applies to wineries, restaurants and accommodations. Well, obviously we managed in the end and when we finally found Casale Mattei it was well worth the search. A really nice place with 4 rooms. The hostess was very helpful and everything appears homely. Even though her English is limited, we managed to gesticulate our needs. Arriving late on the first evening we were guided to the only open pizzeria. Very local and a good start to the weekend. After a wonderful breakfast buffet in the converted barn we drove off to the first Winery, and were invited to take a 5 minute drive to go the actual fields. FWD is not mandatory but definitely recommended. The top 4 rows of grapes are for late harvesting after which the grapes are laid a couple of months until they are nearly raisins, ending up as the Tarasco. Roero Arneis – Very intense nose. Full, but not sustained fine dry fruit taste. Lack of sustainability could be because the wine – surprisingly – was served too cold. André – A fantastic dark golden colour. Interesting deep nose. Wonderful round sustained fruity taste with an undertone of oak. It struck me as a white aspiring to be a red, all though not everyone in the party agreed with this sentiment. Roero Nebbiolo – Fine ruby hue. Pleasant nose and taste. Licorice besides fruit clearly present on the nose, but not persistent in taste. It was obvious that Cornarea focused more on the whites than the reds. Tarasco – Sauterne-like dessert wine. Brilliant golden hue with a very rich nose. Persistent and sustained rich and round taste; not unpleasantly sweet. We bought some Roero and Tarasco. I now regret not getting some bottles of André as well; it was quirky. A very nice and well maintained vineyard with lots of flowers and pots in and around the courtyard. It was the last day of harvesting, and they had a couple of hours earlier had a small party for the workers. Our hostess informed us, that on average a bottle of wine per person had been drunk. That was impossible to see, everything was cleared and immaculately clean. We were again offered to visit the fields, but we were tight for time if we were to make the third visit of the day, so we declined and after a brief tour we went straight to the tasting. The tasting was conducted outside on the terrace in sunshine and 24 degrees. We had booked tasting of 3 whites but were also offered a tasting of their red. Unfortunately, again because of time, we had to decline. Roero Arneis – Fine golden hue. Flowery and somewhat weak nose. Nice, crisp and slightly flowery taste and hint of fruit lasting but not dominating. 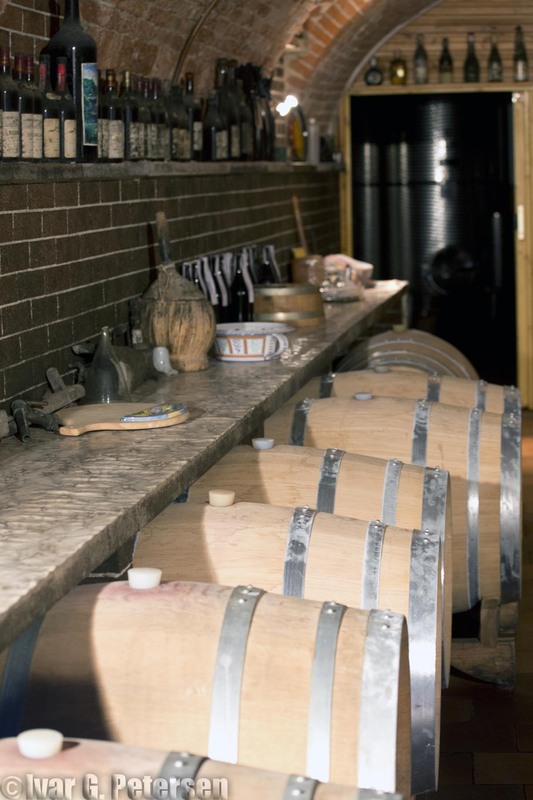 Langhe Favorita – First time any of us tried the Favorita grape. Wonderful fruity nose with round, full and sustained taste. Farnei – ½ Arneis/½Favorita –Surprisingly pleasant taste, which in many ways maintained the qualities of the Favorita without being quite so intruding. 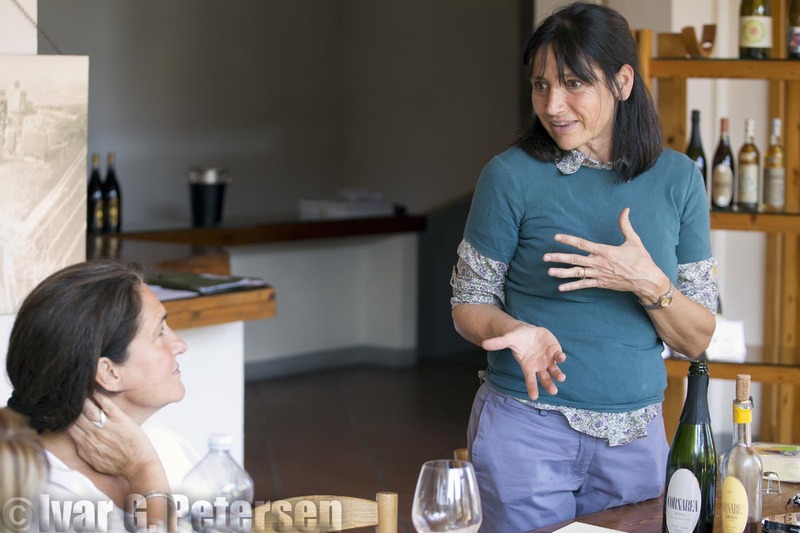 The first two visits were arranged through “Piemonte on Wine“, but the visit at GIGI Bianco was organized directly with Susanna Bianco. They produce 18.000 bottles per year – and employ 3 full time and 7 part time. That, by any measurement, is a very small production indeed. 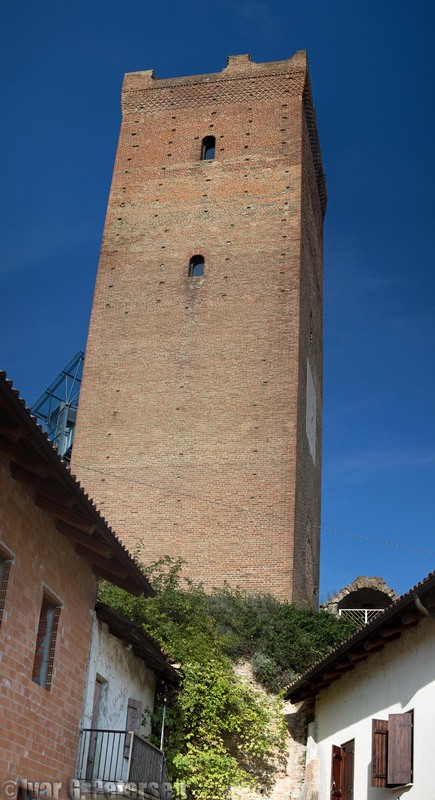 They are top certified and have their barrels and equipment UNDER the Barberesco Tower in the middle of Barberesco Town, which is also where the tasting takes place. Langhe Nebbiolo – Very pleasant with a fine full nose and well balanced persistent taste. Barbera d’Alba – Fine nose with lots of fruit, which together with the oak also was reflected in a round and full taste. Acidity was noticeable in the aftertaste. One of the best wines we experienced on the tour, and also the one we ended up buying the most of. Barberesco Ovello – We started of with the 2011 which is very high scoring , lots of tannin but easily drinkable now. We continued with the 2009 and the party was a little split. I am under the opinion that the 2009 with muscles and spicy roundness is better than the 2011, and that it had nearly the same potential for further development. Another member of the party felt the 2009 is good, but not as good as the 2011, and that the potential is limited. So of course we ended up buying a couple of bottles of each with the plan of doing a blind tasting in 2016 and another in 2017. Time will show who is right. While waiting for the table we took a glass of wine on their terrace. The selection of wine bottles was huge but choices for wine per glass were relatively limited. Being seated, two of us got the tasting menu and the other two a’la carte. I do remember we had a fine Campass Barbera d’Alba, but I have to be honest and declare, that after 3 big tastings plus the rest I do not remember so many more details from the dinner and funnily enough I didn’t take notes. Alba has a fantastic Saturday market with a lot of different crafts and quality products on display and for sale at all the main streets and squares. We strayed a little from the main street La Vittorio Emanuele and managed to come across a very cosy little café with a fabulous beer-list. With a great selection of wines, good food and beer and the opportunity to sit outside enjoying the sun and the 22°C this was the perfect lunch after a morning of shopping. 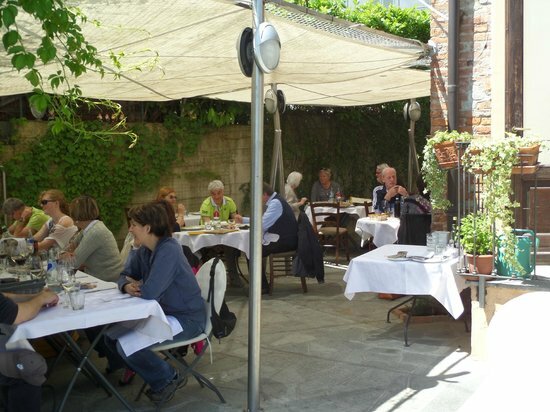 In 2014 we stayed at Canale d’Alba. In a book bought in Albas Touristcenter we found what seemed to be a nice restaurant about 10-15km from where we stayed. It ended up being a fantastic find. A rustic, funny place, well hidden away behind a closed gate. A cosy packed restaurant where we were the only non-Italians, where there were neither a food nor wine menu and where the service was personal, friendly and considerate. This time we stayed in Corneliano, and through our hostess we managed to secure a table at the local restaurant even though it was full. From her instructions we walked the 500m to the restaurant and upon reaching the final street, it became obvious we were back at the same place from last year! This time we sat in the main dining hall and could admire the owners photos and trophies from his time as a player for FC Torino. When we attempted to ask to this past he smiled but then got serious and wanted to know if we supported Juventus! We could truthfully deny this, and all was well but I’m afraid to think what would have happened had we said yes. 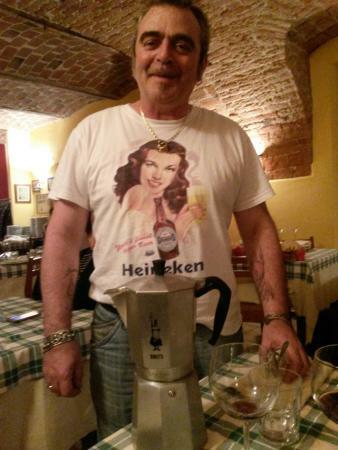 (OK, to be honest, the young waiter who served us and was the only one speaking a little English told us he supported Juventus and that he and the owner enjoyed friendly banter). There are no menus. The kitchen prepares and serves a full Italian dinner with all the courses and the whole restaurant is served at the same time directly from the pots and pans. As to wine, you say which specific grape you want to drink and you get served the wine the restaurant has for that grape at the time. We revisited the Favorita grape but also tried the Barberesco Nebbiolo and the Barbera d’Alba. If you are in the Alba area looking for a dinner place I can strongly recommend the Vagabondi for a thoroughly authentic Italian meal. We were apparently some of the first visitors ever to Prunottos new facilities. Everything obviously appeared new and very cleanly laid out. 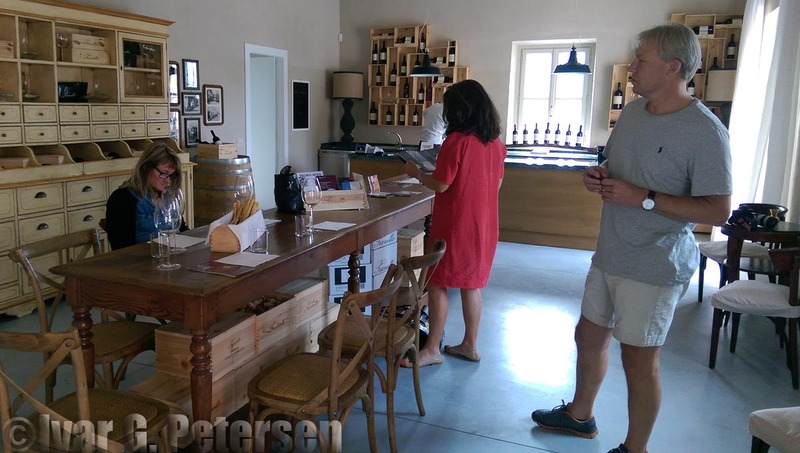 The tasting room was very light with a great view over the hills of Barolo’. It was the first time we tried a local tasting of Barolo. The standard price for a tasting is €5 pp. Some times it becomes free, particularly when you buy wine. A few places it’s free from the outset and we have once experienced it costing €10. Here the price was €15, without anything additional or exceptional on top. Now, €5 or €10 extra does not break a budget, but if you pay 3x what you pay other places, you expect something more. It was definitely good wines we were introduced to, and our host was knowing, friendly and entertaining and probably in command of the best English of any we experienced. 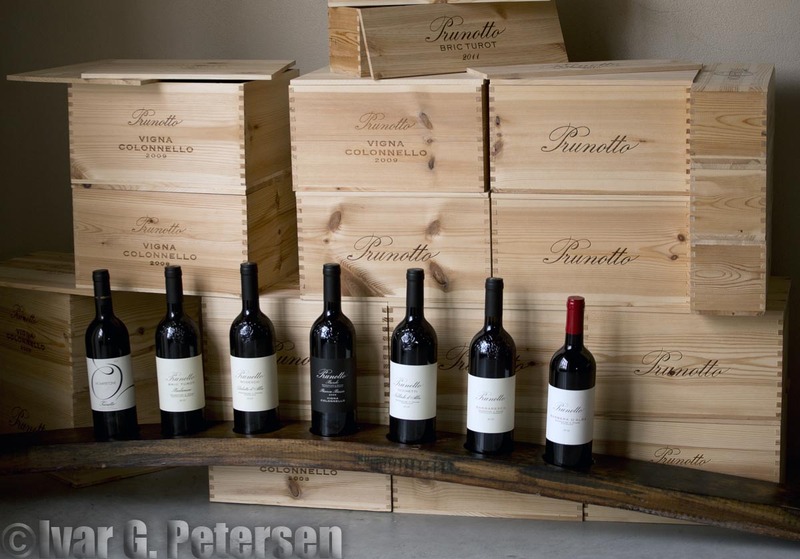 The wines were as expected good and fine wines – without being astonishing or unique. We were at this stage getting close to running out of space for more wine, but had decided that if we came across something exceptional we could take an additional 6 bottles. We didn’t buy any. Asti, on the way to the airport, was an exciting experience. 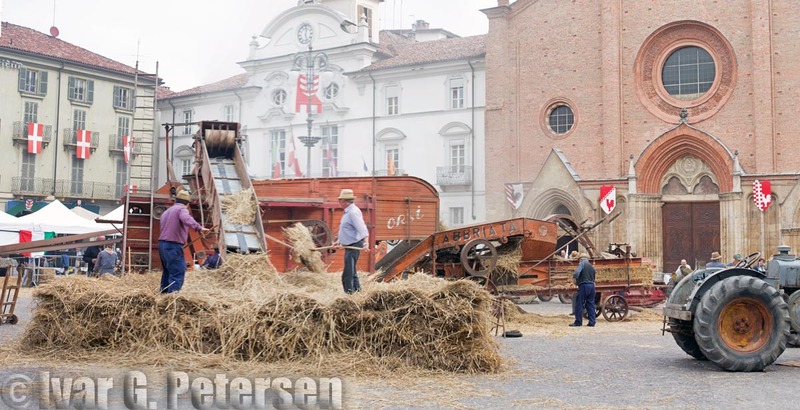 They had a vintage car exhibition on the main square and a medieval market in the central and “old” part of the city, including the pedestrian street. You could experience classic crafts and there were stalls serving very authentic Italian dishes. Pizza was made in stone ovens build on the street and heated with natural fire. We ended up in a fabulous wine-bar that had just enough unstable Wi-Fi to allow us witness FCK lose 1-0 to Brøndby. While waiting to be seated we had a bottle of Cornerea (from our first visit) and for the food we tried an impressive local Asti wheat based beer. They also have a flee market on Sundays – enormous with hundreds of stalls. If you are into that kind of things, you could spend a whole day browsing. We arrived in Milano early Sunday night but there was plenty of life and all shops were open. Easily compareable to New York and Paris as far as life and atmosphere go, but eating, drinking and shopping is very expensive. Still think we will be back for a longer stay next time – 3 hours were not quite enough. At arrival to Linate the 22:00 SAS departure was on the screen with baggage counter information, but our flight at 22:40 was nowhere to be seen. That made us a bit nervous, and we double checked the departure date on the tickets before going to the counter. At the counter, the friendly staff shrugged their shoulders and checked in our luggage, primarily consisting of wine in styrofoam boxes. All air-side shops, cafes etc. close at 21:30, so if you want a snack or a last glass of wine when you are leaving on a late flight, you can’t hang around in the departure area after passing through Security. Previous PostReview of Les Mills BodyCombat Release 64Next PostDear Dan & Rachel: What are you doing to our BodyCombat?